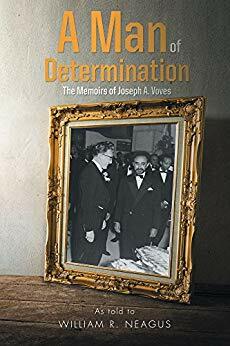 “A Man of Determination” is a compelling biography about the life of Joe Voves, an ordinary man with an extraordinary journey. The author tells the accounts of Joe’s inspiring determination to achieve success and thrive in life. Readers will find Joseph Voves’s story a true reminder that through perseverance and hard work, one can have a better chance in life. It’s a story that recalls Joe’s life growing up as a son of an elementary school principal in rural Czechoslovakia, living through the Nazi occupation, escaping from the Communist secret police following World War II, and then illegally sneaking into France to start a new life. This book looks back to his amazing experience working as the general manager of the Ethiopian Hotel Co. owned by the Ethiopian Imperial Family and finally being granted an entry visa to the United States. William R. Neagus narrates a story of a man’s determination throughout the challenges that he faced in his life. Readers will find Joe Voves’s story a true reminder that through perseverance and hard work, one can have a better chance in life. The book recounts how he triumphed through all the insurmountable trials in his life by simply never giving up. Surely, it’s made clear that Joe’s journey was truly an awe-inspiring one. After obtaining his entry visa to America, Joe decided to make his trip an adventure and traveled with his best friend across Equatorial Africa during a time of uprisings before arriving at the United States 1959. His experience in America was also life-changing. He started out by becoming the maître d of one of the finest restaurants in New York, but soon identified a need in America and co-founded a company that supplies metric nuts and bolts and other measuring devices in the U.S. That company is still thriving today. Most of all, this memoir emphasizes that while Joe’s success is inspiring, he also has had a selfless desire to help others. The author also talks about Joe’s membership in Rotary International where he personally helped others who are seeking their own ways to thrive and succeed. Indeed, his is a story that will remind readers that there are people in the world who are not afraid to make a difference to the lives of other people no matter how big or small. In the hopes of inspiring more readers, “A Man of Determination” takes part in the upcoming 2018 Frankfurt International Book Fair. Happening on October 10-14, 2018, the world’s largest trade fair for books will showcase thousands of books and titles from different genres and Neagus’ inspiring memoir will surely be one of them. So, be sure to check it out! Published by: Page Publishing Inc.
Born in New Bedford, Massachusetts, William R. “Bill” Neagus has been a professional writer since he graduated in 1977 from the University of Massachusetts Dartmouth. He became a newspaper reporter, covering local government and cultural events for the Norwich Bulletin. He worked there for a year-and-a-half before joining The Herald in New Britain, Connecticut, as its city hall reporter. New Britain was a very political city, but Bill was able to see through the chaff. He also covered a major civil service corruption probe while there. Meanwhile, his appetite for politics grew in 1985 when he became The Herald’s political reporter, covering the Connecticut State Capitol and politics. Influenced by a state senator, Bill began studying for his master of public affairs degree at the University of Connecticut. He graduated in 1990, six months after changing careers to become the media relations manager of the Connecticut Business and Industry Association. He was still writing, but this time it was subjective instead of objective. Eight years later he continued in the public relations world, becoming managing director of Jacobs & Prosek Public Relations. He represented utilities, law firms, not-for-profit organizations, banks, manufacturing firms, and real estate developers as he led the public affairs practice group. After another 10 years, he formed his own public relations firm, while simultaneously serving as an adjunct professor teaching public relations writing and corporate public relations at Quinnipiac University. Finally, Bill became a job developer for the ARC of the Farmington Valley in Connecticut, networking with businesses to secure jobs for the intellectually disabled.